Rigaku Innovative Technologies, (RIT) is a full service solution provider of high flux, high precision, high reflectivity multilayer X-ray optics for hard and soft X-rays and EUV-XUV applications. For applications in laboratory X-ray instruments, RIT multilayer optics are sold under the Ovonyx™, Max-Flux®, Confocal Max-Flux® and VariMax™ brand names. Our optics are engineered, coated and manufactured to the meet or exceed the most stringent optical specifications while maintaining the most versatility of all commercially available optics. Options include single or multi-wavelength coatings, periodic or graded (depth, lateral, radial or bilateral) d-spacing over flat, cylindrical, spherical, aspherical, parabolic or elliptical shapes with sizes ranging from 0.3mm to 1.5 meters. All optics shown on this page collect and either focus or collimate only the desired wavelength from divergent X-ray sources providing fast, accurate data collection in a home lab environment. Browse below or contact us today to find the best solution for your X-ray analysis. Rigaku Innovative Technologies, (RIT) pioneered the engineering of multilayers for use in X-ray optics. 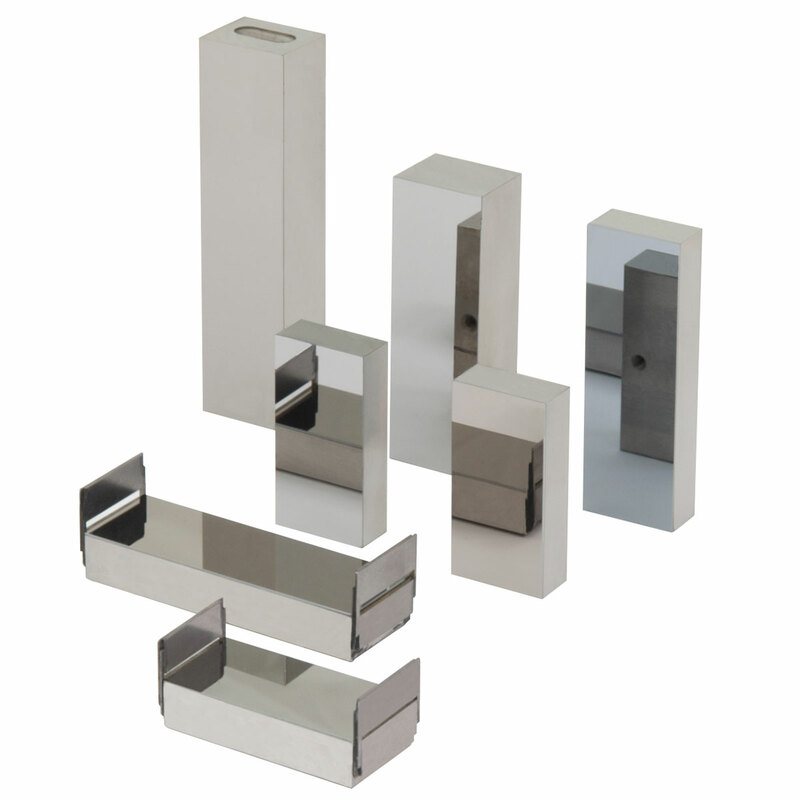 Our multilayers are available in a variety of shapes and sizes, flat or curved, mounted or unmounted, to fit any X-ray Spectrometer. 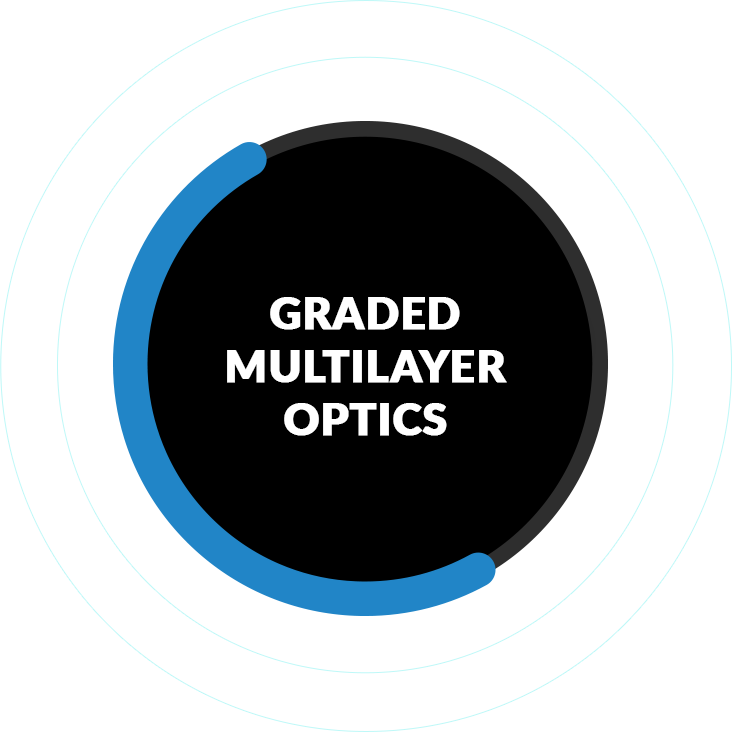 Ovonyx™ multilayers can be used in sets for the analysis of different wavelengths and are available in planar or cylindrical configurations for sequential and simultaneous or Rowland Circle spectrometers. Careful selection of coating materials, d-spacing and manufacturing processes provides the most intensity of any competing X-ray multilayer, making Ovonyx™ the first choice for spectrometer manufacturers. A sample of our customers include PANalytical, Cameca, JEOL, Oxford Instruments, Shimadzu, and Thermo Fisher Scientific. 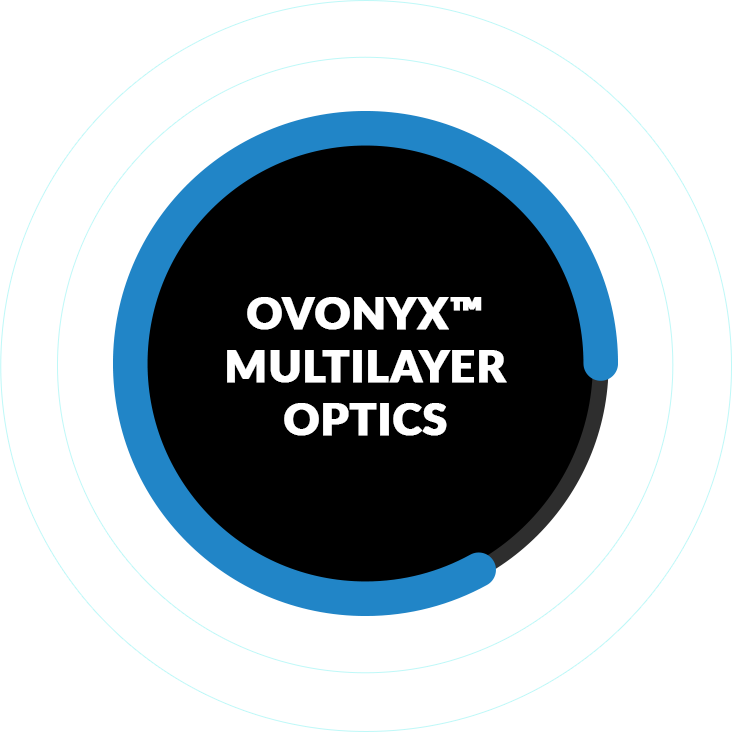 Designed for high reflectivity, Ovonyx™ multilayer optics provide users with high-order suppression leading to reduced background noise. Excellent stability to substances and temperature effectively extends the life of your optic, maximizing your return on investment. Ovonyx™ Analyzers cover either a broad range of wavelengths or, for the best possible results, one or two specific wavelengths. 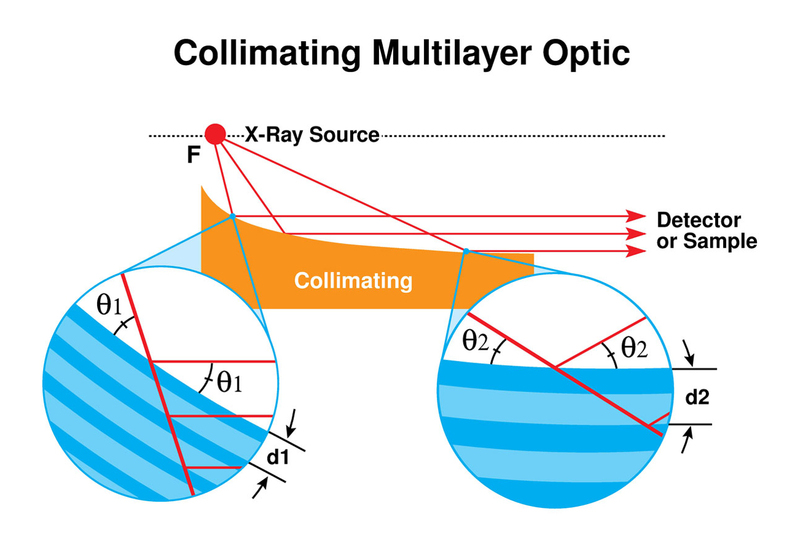 The Max-Flux® brand of focusing and collimating optics are specifically designed to collect large solid angles from any X-ray source rendering the X-ray beam monochromatic. RIT offers a broad range of optics for your diffractometer, regardless of manufacturer or model. Max-Flux® products are elliptical or parabolic optics wherein the d-spacing of the multilayer is graded along the length of the optic, thereby satisfying Bragg’s law at every point along the aspheric optic. This innovation results in a significant improvement in total flux on your sample. Figure 3: One elliptical cylinder will transfer a divergent X-ray beam from a point or line–focus source to a line focus. When cross-coupled as in Figure 5, two elliptical cylinders will create a spot focused beam in two dimensions from a point-focus source. Figure 4: A parallel beam creates symmetrical peak shapes, accurate 2Ө values and removes specimen displacement errors for when used in a diffractometer. Max-Flux® optics are available for W Lα, W Mα, Ag Kα, Ag Kβ, Cu, Mo, Ti, Co, Au, Cr, Ga, In and other X-ray energies. 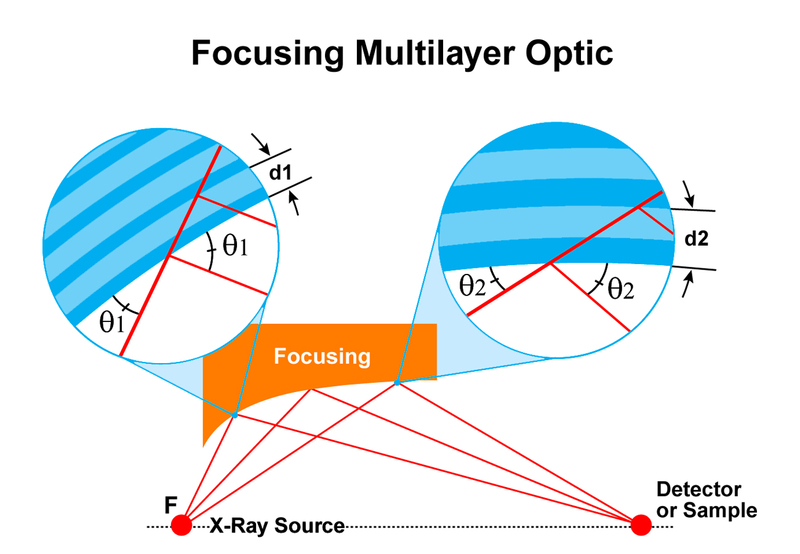 When the highest optical precision is required, proprietary Arc)Sec® technology is combined with Max-Flux® optics to provide multilayer optics with figure precision of < 4 arcsec. 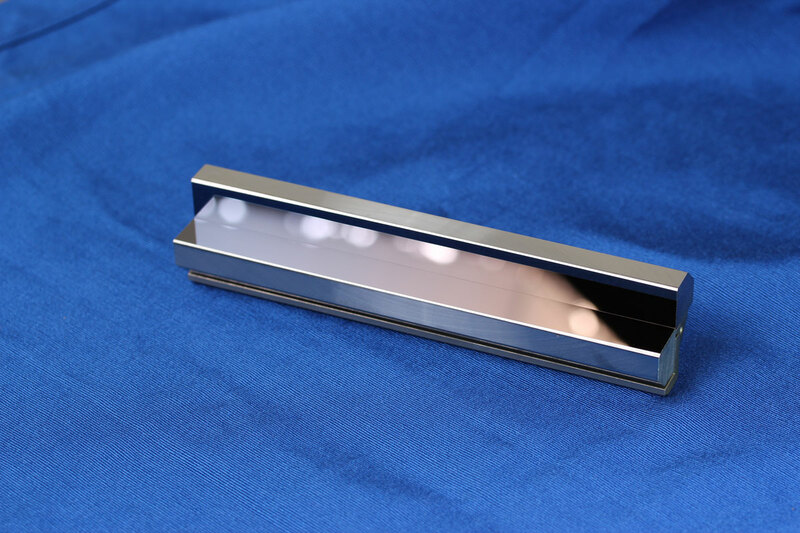 RIT’s Arc)Sec® optics provide a more uniform beam and higher intensity especially when using a channel cut monochromator. Easy alignment, higher brilliance and improved data quality make the Max-Flux® brand of optics the first choice for High Resolution X-ray Diffraction, Thin Film Analysis, Reflectometry, Powder Diffraction, Texture Analysis, Stress/Strain Measurements, Total Reflection X-ray Fluorescence (TXRF) Spectroscopy and more. Confocal Max-Flux® Beam Conditioning Optics for X-ray diffraction offer high intensity, high flux, high flux density, and high resolution. 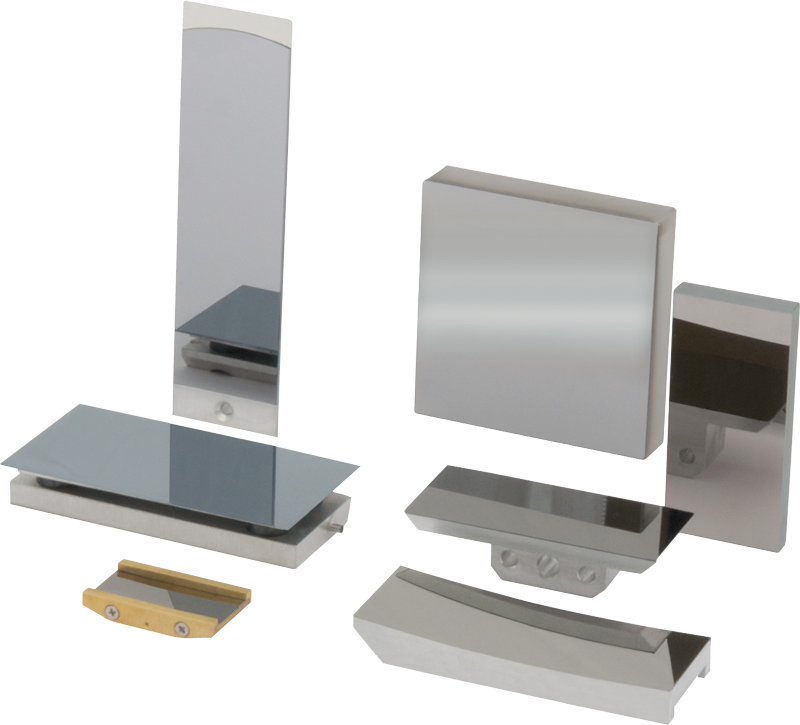 The unique side-by-side optical geometry creates a compact assembly which can simultaneously monochromatize and either focus or collimate a divergent X-ray beam. When the highest optical precision is required, proprietary Arc)Sec® technology is combined with Confocal Max-Flux® optics to provide multilayer optics with < 4 arcsec precision in optical figure. Arc)Sec® Confocal Max-Flux® optics provide increased flux and decreased background with very uniform beam profiles, capable of achieving beam spots under 5 microns diameter. 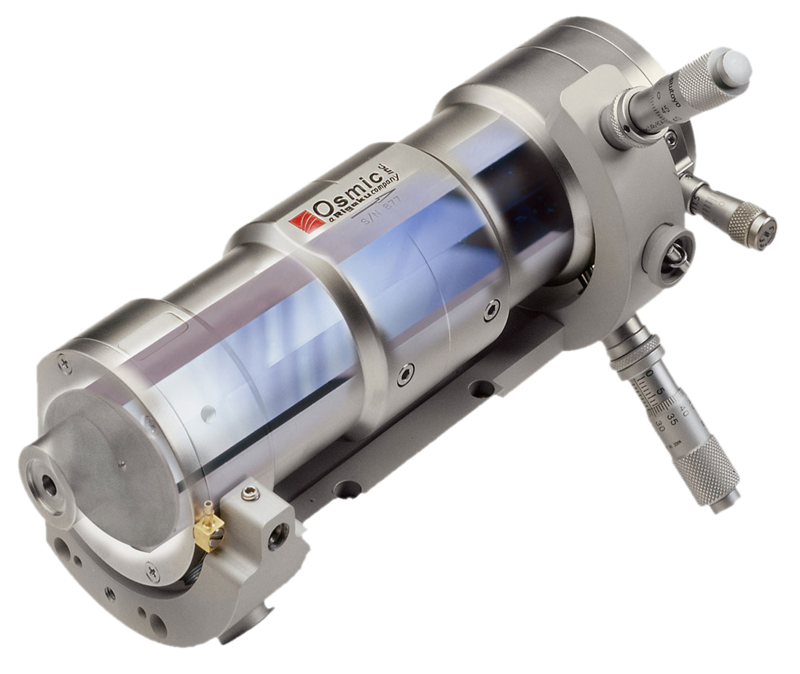 When paired with Rigaku’s MicroMax™ 003F X-ray source and a PSR™ scatter-free pinhole, the X-ray beam can be further and more accurately defined thus increasing the flux throughout your analytical instrument. 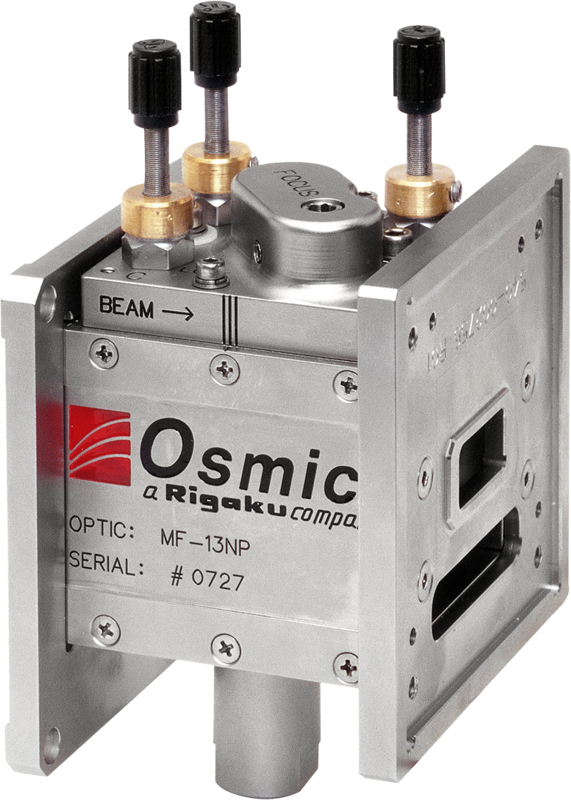 Rigaku’s Confocal Max-Flux® optic, often referred to as Osmic® optics, combines two Max-Flux® graded multilayer optics to collimate or focus a beam in two dimensions. 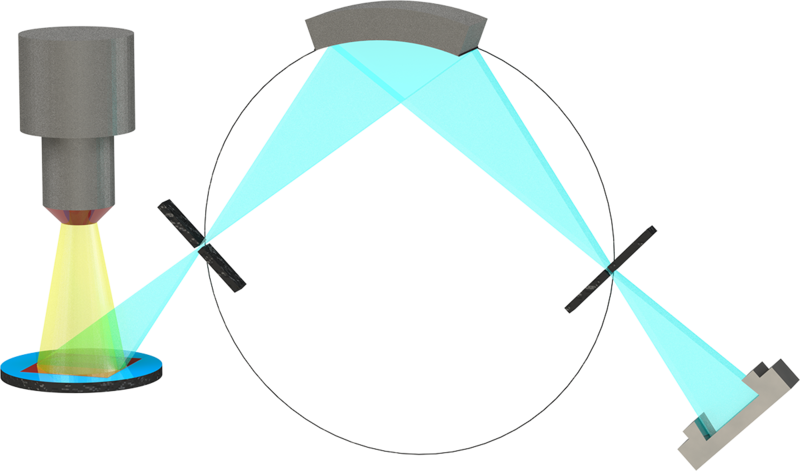 Figure 6: Divergence of the reflected beam will be the same in both directions for parabolic mirrors. 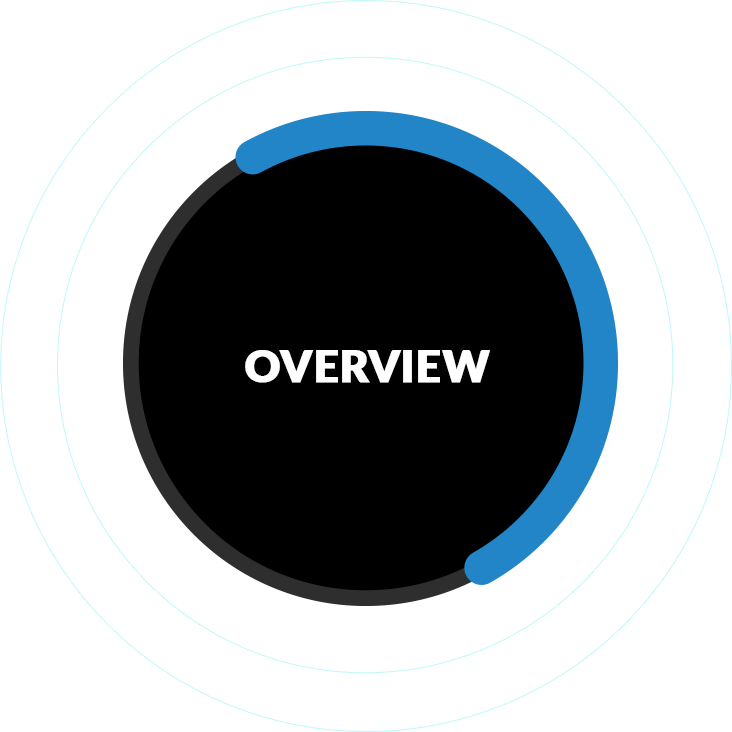 Magnification will also be the same in both directions for elliptically-curved mirrors. As the longest operating commercial manufacturer of multilayer optics, RIT’s Confocal Max-Flux® optics provide the highest flux, cleanest spectrum and most uniform beam profile of any multilayer optics available today. Customizable bandwidth can be achieved by configuring the optic and multilayer parameters. VariMax™ optics are an extension of the highly popular Confocal Max-Flux® product line. VariMax™ optics offer the highest brilliance and flux for protein crystallography and small molecule diffraction. In addition, divergence can be tailored to achieve the best results on your crystal. Using a novel patented design, divergence in both planes is simultaneously adjusted to achieve the highest useful flux on your sample. The result is an analysis that is both fast and precise. VariMax-VHF on an FRE+ is proven as the world’s most brilliant analytical X-ray source! Figure 7: Available in a dual-optic housing to allow easy change from one energy to another energy, often without realignment. Any combination of existing VariMax optic wavelengths is possible. 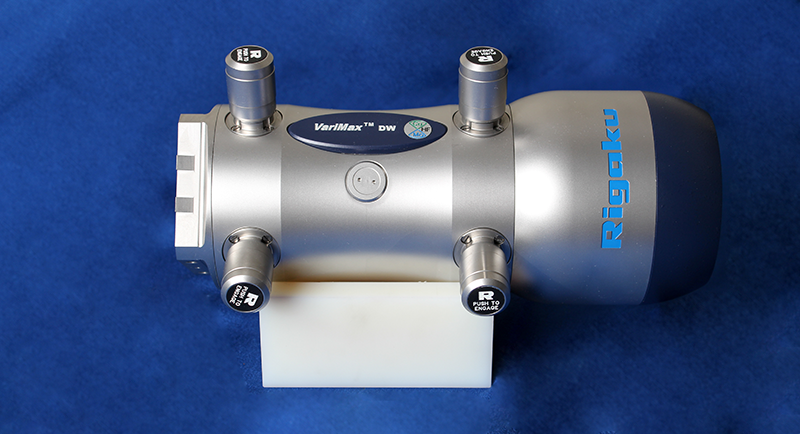 Increase your data collection ease through use of VariMax DW and one of Rigaku DW rotating anodes. When the highest optical precision is required, proprietary Arc)Sec® technology is combined with VariMax™ optics to provide multilayer optics capable of < 4 arcsec. Arc)Sec® VariMax™ optics provide increased flux and decreased background and excellent beam control.